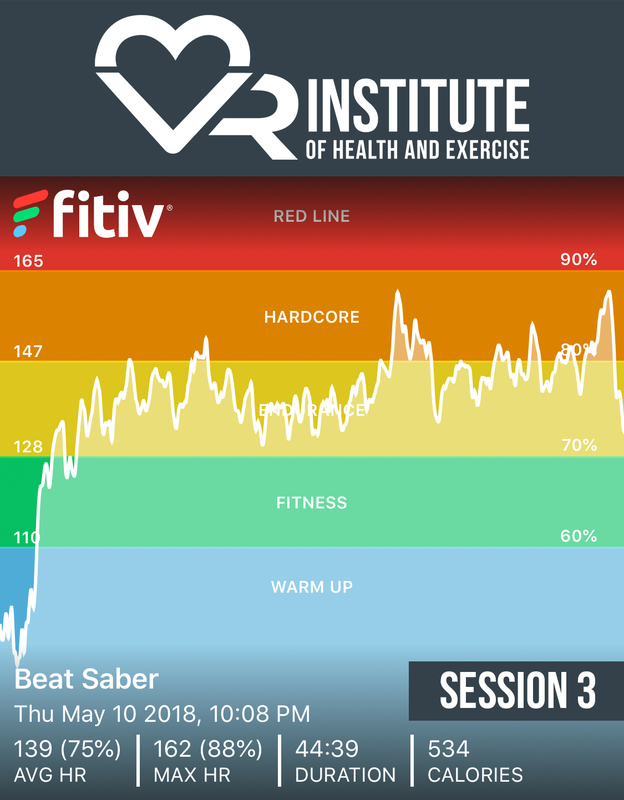 Beat Saber’s primary exercise comes from the fast upper body movement needed to slice musical blocks, along with moderate side-to-side leaning, and occasional squats to avoid obstacles. However, other than ducking, Beat Saber did not require the player to move their feet much in order to be successful at the game. While oncoming obstacles do require the player to lean to the left and the right occasionally, they do not require it enough to physically move from side to side. This makes Beat Saber fairly playable in a smaller space, but also limits one of the primary motions VR/AR games can use to raise heart rate. 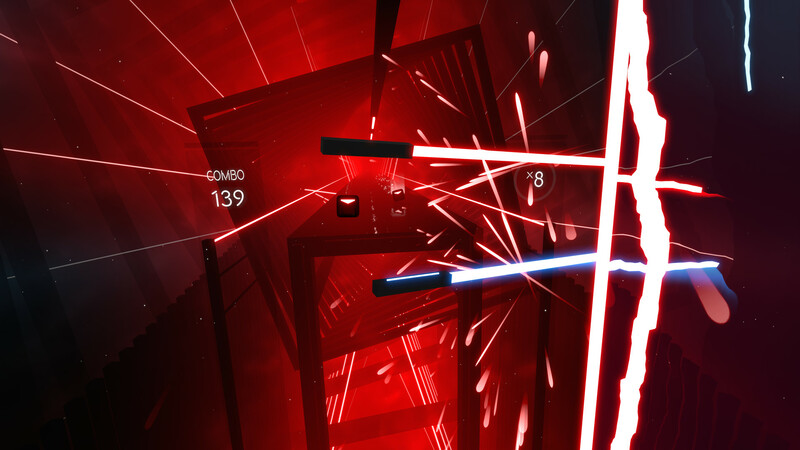 Beat Saber is a game that highlights the impact of skill on its potential as exercise. 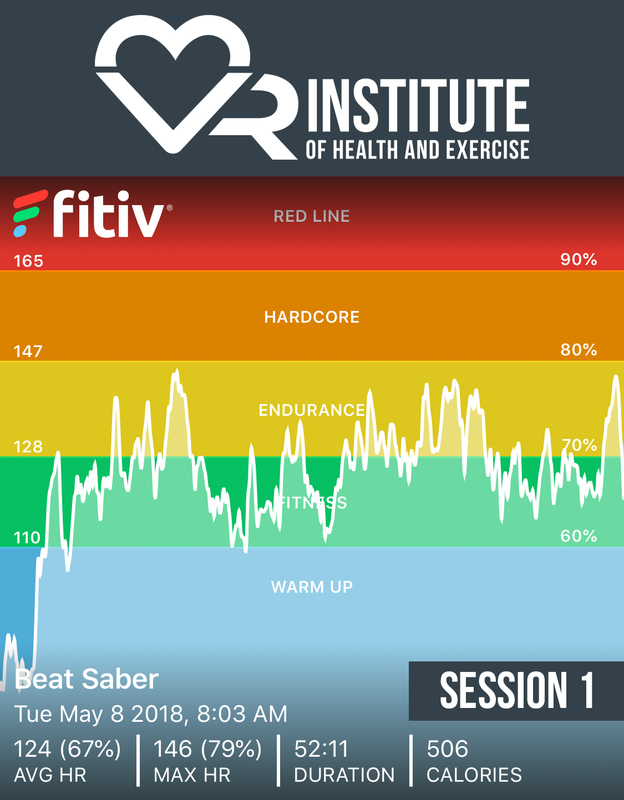 The rater played Beat Saber for ~4 hours prior to recording data for rating, and successfully earned a B or above on Expert difficulty during the rating period. However, they were not even close to being able to reliably beat later songs on the highest difficulty setting. The rater believes that if they were more skilled with the game, they would be able to achieve moderately higher levels of energy expenditure. 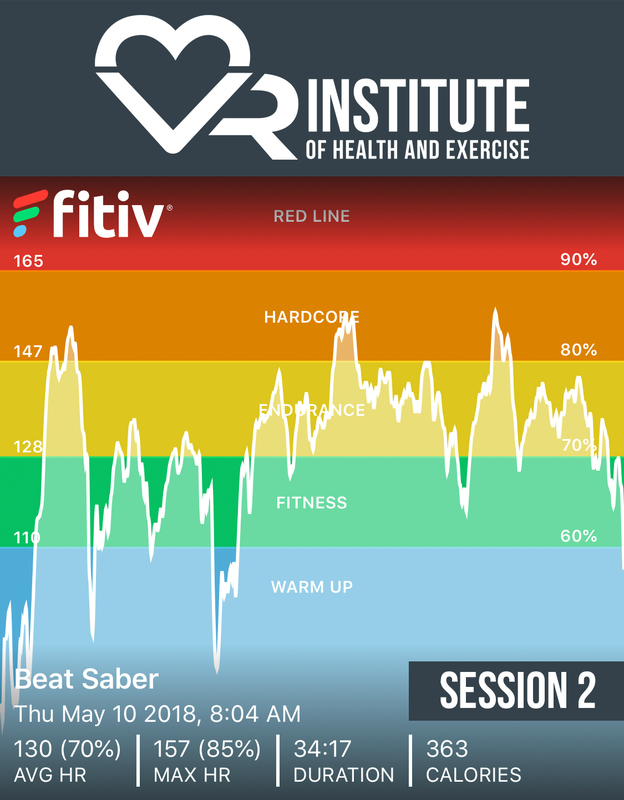 To illustrate this, we have posted the heart rate data from the rater’s four separate sessions, each as they got progressively better and able to play at higher difficulties. 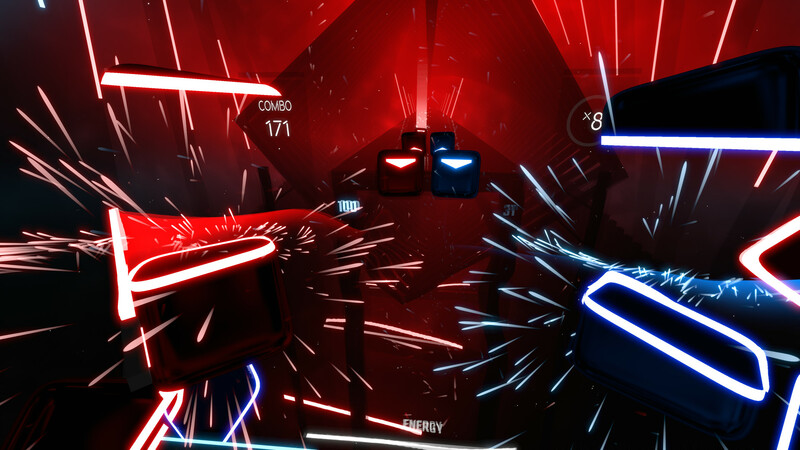 Ratings for Beat Saber were based on the final session, the highest observed energy burn in a controlled setting. Gameplay is consistent from beginning to end, playable for extended times, and raters felt that their sample was likely representative of a typical play across most moderate to expert skill levels. 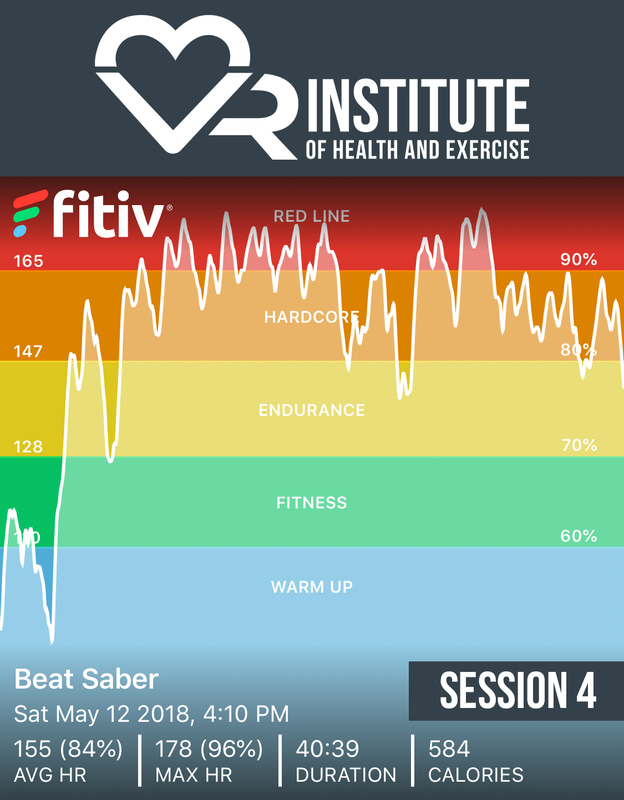 Exercise Hints: Beat Saber is a very viable option for a cardiovascular workout. By default, however, Beat Saber ends and restarts gameplay if a player fails to perform well enough. In other words, instead of letting the player finish a level regardless of skill, and grading them poorly (eg. 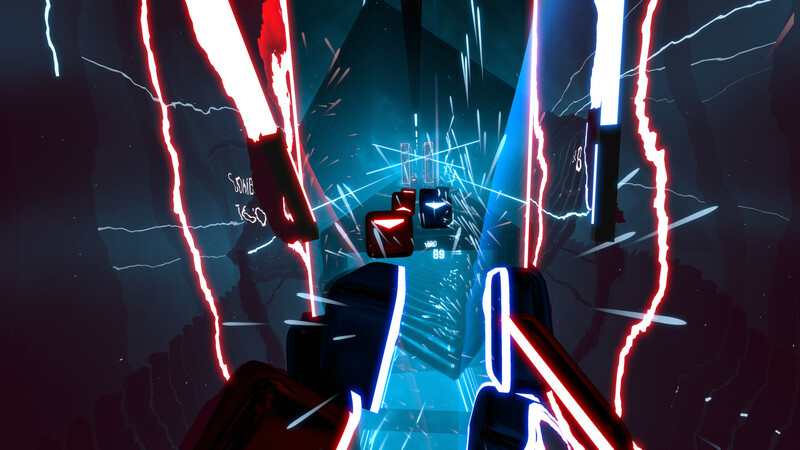 Audioshield), Beat Saber will “Fail” the player and quit the level if they miss too many targets, similar to classic rhythm games like Guitar Hero. This approach leads to more downtime for a player learning on the harder difficulty settings, which makes it more difficult to maintain a steady heart rate when playing at the upper range of your skill. Thankfully, Beat Saber offers the ability to turn this off, though it then stops recording your score on the leader boards. We hope that Beat Saber in the future adjusts this so that instead of reporting no score, it creates a separate score board for each mode, since we think the intrinsic motivation of leader boards is helpful. From an exercise standpoint, the data supports that turning off the Fail mode results in more consistent exercise, since it allows users to play at harder difficulties – which tend to be faster – without having to start and stop regularly. Please Remember: Rating notes are only intended to convey information about characteristics that may impact the game’s intensity of exercise. It is not intended to be a review, or provide a qualitative opinion of the experience itself. Est. calories expenditure per min. : We observed an energy expenditure of 6.55 kcals to 7.45 kcals per minute during our tests. Please see the table below for an estimate of calorie expenditure for your weight. 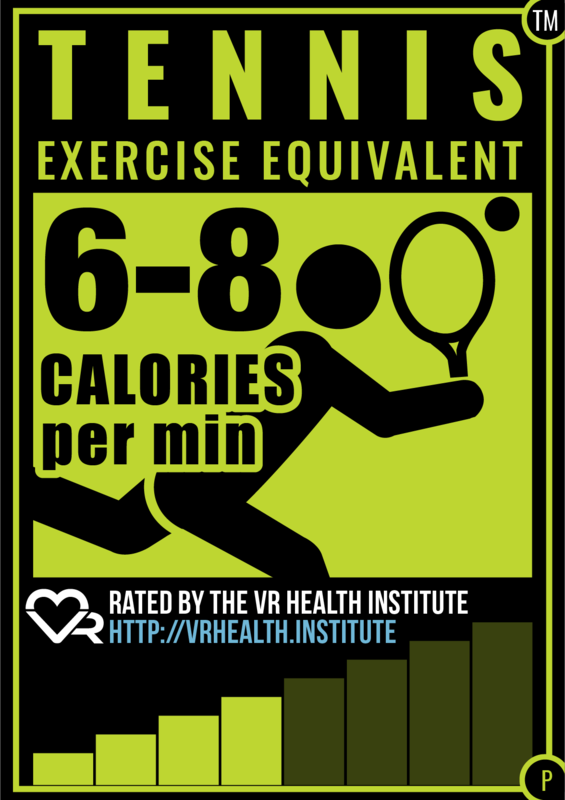 Note: When this rating was first published, the review displayed the calorie burn rate of a typical person weighing ~175 lbs, instead of the standard 60 kg (~132 lbs). We changed this display to reflect the badge, which assumes the 60 kg standard weight. This does not affect the rating, its tennis equivalency, or its results – they are based of MET scores, and have not been changed.